Are you dealing with a histamine intolerance? If so, I’ll bet you’re frustrated by the symptoms that seem to come out of nowhere, ranging from headaches, to an itchy runny nose, face flushing, unexplained anxiety, and a myriad of other issues. I had histamine intolerance myself, so I get it! I suffered from these awful headaches that would spring up out of the blue, and I could not figure out what was triggering them. So, I dove into functional medicine mode to identify the underlying cause of the issue and discovered that I had a histamine intolerance. 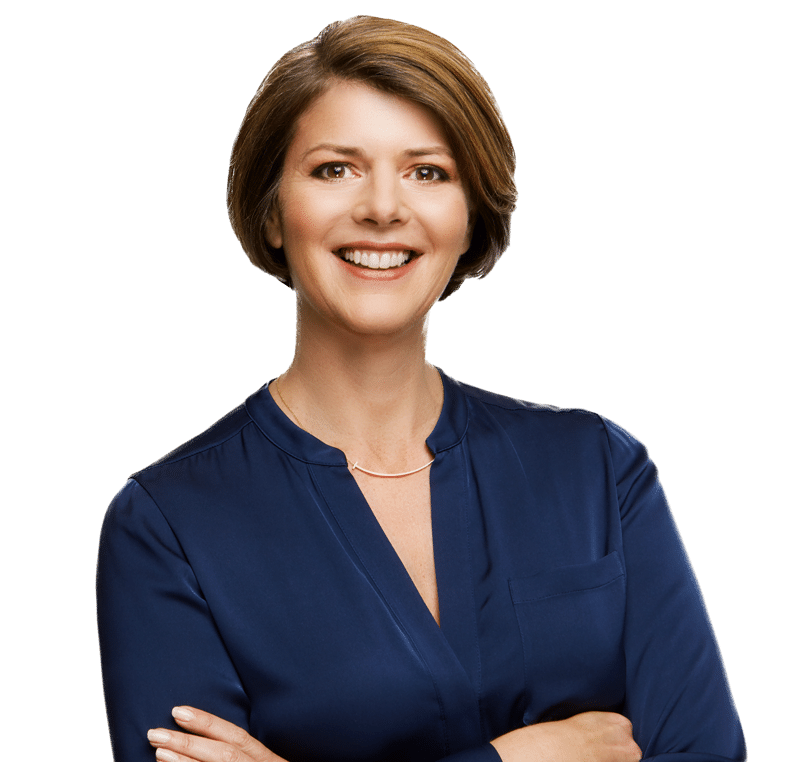 Digging even deeper, it turns out that for me–and for many of my patients who also had histamine intolerance–a gut infection known as small intestinal bacterial overgrowth (SIBO) was at the root of my symptoms. 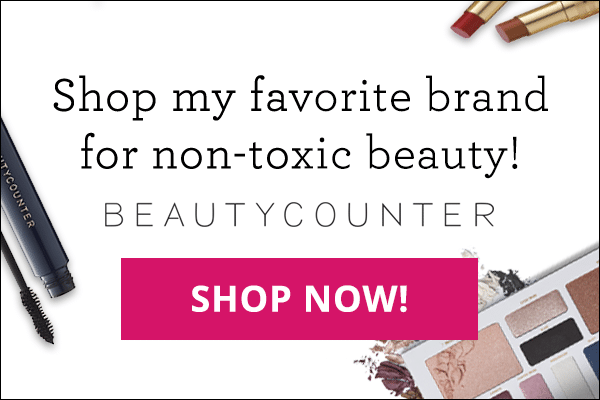 By overcoming SIBO, I was able to resolve my histamine issues as well. Let’s back up for a second and talk about what histamine is, and what histamine intolerance looks like. 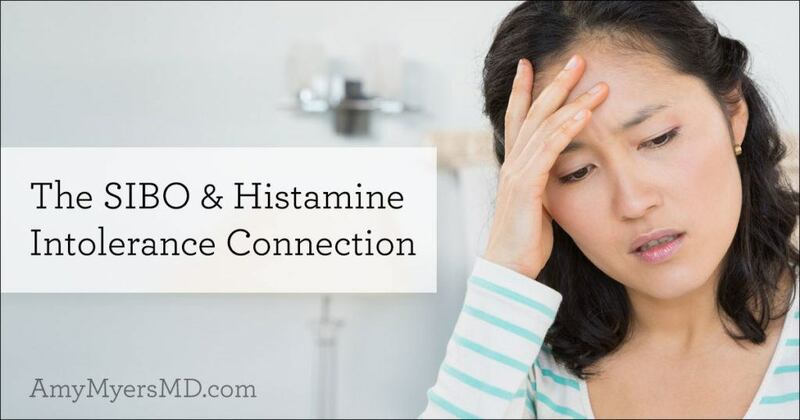 I cover this topic extensively in my article, Everything You Need to Know About Histamine Intolerance, and I’ll go over the basics here. Histamines are chemicals produced by your immune system that create inflammation in response to an attack by an outside invader. Histamine is also a component of your stomach acid that aids in digestion by breaking down foods in your gut. There are a variety of foods that either contain histamine or cause your body to release histamine when you eat them. 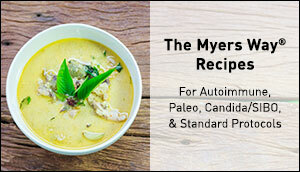 You can find a list of these foods in my article on histamine intolerance. Histamine works by causing your blood vessels to swell, or dilate, so that your white blood cells can quickly find and attack the infection or problem. You’re probably familiar with this effect when you get bitten by a mosquito and there is local swelling and redness at the site, along with itching and even pain. Histamines also react to allergens such as pollen by prompting the thin membranes in your nose and throat to produce more mucus, causing the runny nose, sneezing, itching, and coughing associated with seasonal allergies. That’s why people experiencing allergic reactions are often given “antihistamines” to control the release of histamines that produce these symptoms. How Do You Develop Histamine Intolerance? Your body produces enzymes known as diamine oxidase (DAO) that keep your histamine levels in check. If for some reason you don’t break down histamine properly, it begins to build up and you develop what we call histamine intolerance. Excess histamine can be caused by a number of factors, including low DAO levels, allergies, leaky gut, GI bleeding, histamine-rich foods, and SIBO. 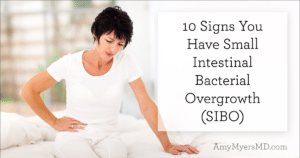 SIBO is an overgrowth of good or bad bacteria in the small intestine, where there should actually be relatively few bacteria as compared to the colon and large intestine. The primary causes of SIBO are diets high in sugar and refined carbs, antibiotics or other medications that disrupt your delicate microbiome, or physical obstructions in the gut such as scarring from surgeries or Crohn’s disease. Food sensitivities such as histamine intolerance almost always indicate there is something going on in your gut. In my practice, I’ve found that SIBO is the leading culprit in histamine intolerance due to the following reasons. SIBO causes an increase in food sensitivities, which is why this gut infection could be to blame if you suddenly start experiencing an intolerance to histamines. Inflammation in your gut leads to intestinal permeability, otherwise known as leaky gut. When your gut lining is compromised, food particles can pass through and enter your bloodstream. Your immune system responds to these “invaders” by ramping up and triggering the inflammatory symptoms you experience as histamine intolerance: flushing, hives, headaches, etc. 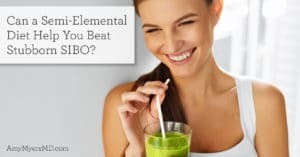 SIBO also causes dysmotility, which inhibits your ability to properly digest foods and allows both food and bacteria to sit in your digestive system longer, further exacerbating inflammation, leaky gut, and food intolerances. Not everyone who has SIBO has histamine intolerance. Those who do likely have a build-up of histamine-producing bacteria as their overgrowth. Certain species of bacteria, including L. casei and L. bulgaricus, have been shown to increase histamine production.1 For this reason, if you suspect you have SIBO you’ll want to make sure you’re not adding fuel to the fire by taking a probiotic that contains lactic acid-based bacterial strains. Instead, opt for a soil-based probiotic such as the one I carry in my store. Intestinal inflammation that occurs when you have a gut infection such as SIBO leads to a deficit in DAO, the enzyme responsible for breaking down histamines in your digestive tract. This in turn causes an increase in circulating histamine. As you intake more and more histamine-rich or -producing foods your DAO levels will be unable to keep your histamine levels in check, and you’ll eventually develop an intolerance. DAO can also be blocked by certain foods, including alcohol, energy drinks, and tea, so if you have histamine intolerance or SIBO, you should avoid these foods at least until your symptoms have cleared. Histazyme, a DAO supplement, can help you break down foods and offer digestive support when dealing with histamine intolerance. If you didn’t have enough reasons to get your stress levels in check, reducing stress could also help you overcome histamine intolerance! That’s because prolonged emotional stress can cause or exacerbate SIBO by impairing your motility, negatively altering your gut microbiome, and stimulating mast cell production. Mast cells are white blood cells that line the GI tract and are found throughout the body in connective tissues. They are the “master regulators” of the immune system, and secrete histamine and other cytokines.2 So if you have histamine intolerance, in addition to repairing your gut, you’ll also want to take measures to relieve your stress in order to break the vicious cycle of infection and inflammation behind your symptoms. Step 1. Remove the foods that feed SIBO, including sugar, alcohol, and carbohydrates. Step 2. Attack the bad bacteria. The primary antibiotics used for treating SIBO are Xifaxan and Neomycin, depending on the type of gas being produced by your gut organisms (methane or hydrogen). As a natural alternative to antibiotics, I recommend Microb Clear™, which is a blend of magnesium caprylate, berberine, and extracts from tribulus, sweet wormwood, grapefruit, barberry, bearberry, and black walnut. Step 3. Restore the good bacteria with probiotics. 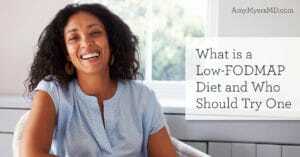 The best probiotics for SIBO are soil-based probiotics, as lactic acid-based probiotics are not well-tolerated in those with SIBO and may actually be adding fuel to the fire. The one I use with all my patients is Primal Earth™. There’s no doubt that histamine intolerance can be distressing, especially if you’ve been eating histamine-containing foods your whole life without any issues! 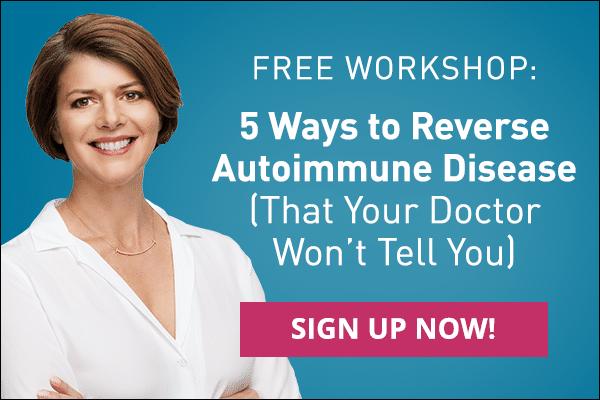 However, by getting to the root of your symptoms–and treating any underlying conditions such as SIBO–you CAN overcome histamine intolerance and start living the symptom-free life you deserve! And remember that while you are working to clear SIBO, a DAO supplement such as Histazyme can be immensely helpful for easing your digestive troubles and minimizing your body’s reaction to high-histamine foods.